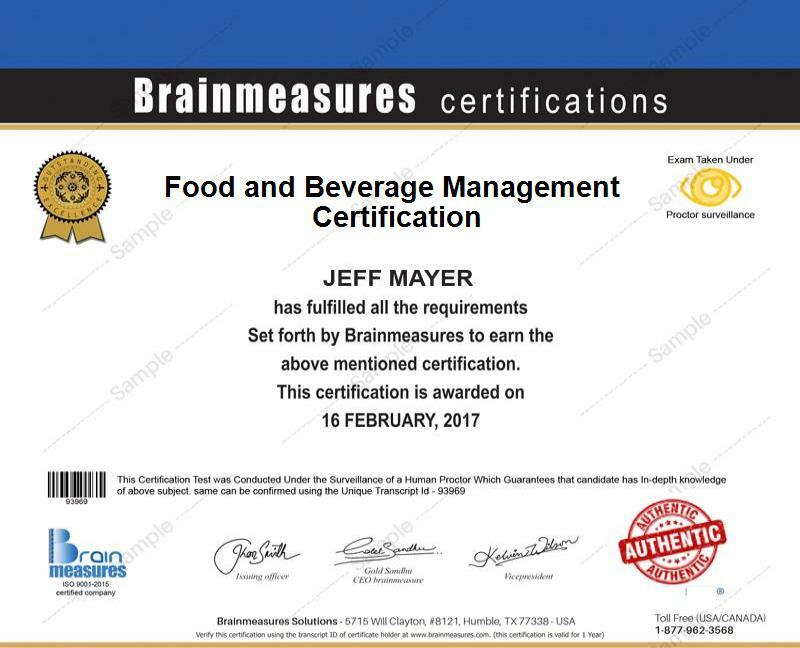 Being a food and beverage management expert is no longer that hard with the existence of the food and beverage management certification program offered by Brainmeasures. The food and beverage management course offered by Brainmeasures is highly comprehensive enough that you will never regret enrolling in it. This certification course allows you to receive the most comprehensive training so you have an assurance that you will be able to learn all the current practices used in the food and beverage management industry. With the help of this food and beverage management certification course, you will become more familiar about the scope and major functions of the field including the basics of managing the quality of food service as well as stewarding. It also reflects all the essential aspects of management including purchasing, sales promotion, storing, issuing, production and service, food menus and beverage list and how these are applied to effective food and beverage management. A food and beverage management test also forms part of the program. You need to successfully pass this food management exam in order for you to finally get a hold of your certificate and start holding the most stable position in the industry. The food and beverage management certification program which is now available at Brainmeasures caters to the needs of a wide range of individuals and professionals. This is most suitable for existing and aspiring food and beverage managers, key front of staff house, restaurant and banqueting team leader and any professional who is responsible in overseeing the daily operations of a food business. A more decent amount of salary is also something that you can expect after you receive your food and beverage management certification. Completing a food and beverage management certification course allows you to work in prominent and highly reputable restaurants and hotels and this will allow you to earn within the range of $32,000 to $62,000 annually. The level of your experience will allow you to further increase your rank in the specific food and beverage industry where you are working and this translates to an increase in your annual salary as well.